The Ram 2500 offers incredible capability no matter what you need it for, and continues in its quest to be one of the best heavy duty pickups on the market. The 2500 continues to offer class-leading towing power and capability. New features for 2015 include the availability of work-grade vinyl seats and power-folding towing mirrors. In addition, the Ram Power Wagon now comes equipped with hill descent control. Under the hood, the Ram 2500 comes equipped with its legendary HEMI engines to offer incredible torque and horsepower. The 2500 comes equipped with a standard 5.7-liter HEMI V-8 engine with 383-horsepower and 400 pounds-feet of torque. There are further options for even more power and capability, including an available Cummins turbo-diesel 6.7-liter V-8 which provides 660 pounds-feet of torque, or 350 horsepower when equipped with a six-speed manual transmission. With the six-speed automatic, the Ram 2500 offers 360 horsepower and 800 pounds-feet of torque. The Ram 2500 is also available in either four or rear-wheel drive. The Ram 2500 offers tons of interior luxury and exterior highlights to make even your toughest job easier. Outside, the 2500 comes equipped with a variety of grille finishes and the option of three different size wheels. Optional features are extensive, and include a power sunroof, spray-in bedliner, power-folding heated side mirrors, fog lights and RamBox storage bins in cargo-bed sides. On the inside, the 2500 can be equipped to serve as a sort of mobile office, with places to hold hanging folders, a navigation system and 8.4-inch touch-screen. Further options include remote start, real wood trim, heated steering wheel and even more. 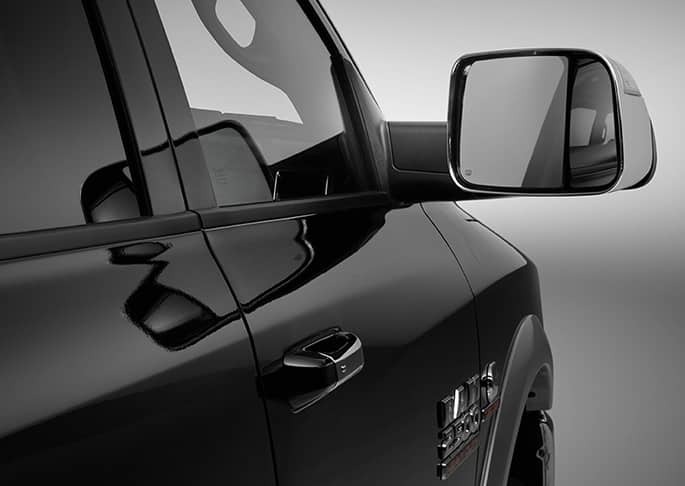 The Ram 2500 is fully equipped with a multitude of safety and security features. Standard features include anti-lock brakes, electronic stability system, front air bags, side curtain airbags, and side-impact airbags. Available features also include a backup camera, integrated trailer brake controllers and rear parking sensors as well as further features to make your 2500 even more capable, including electronic roll mitigation, trailer-sway control and hill start assist. For more information on the 2015 Ram 2500, give us a call today!